My running continued to improve and by December 2013, I found myself at the University of Florida, performing a VO2Max test. This test measures your ability to absorb and utilize oxygen, what combination of sugar and fat is used as energy, heart function and maximum heart rate. As you start running on a treadmill, equipped with a mask to analyze breath and electrodes attached to your chest monitoring mainly heart function, the speed and incline is gradually increased. When exhaustion is reached, the test is complete, for me this was about sixteen minutes in total. The actual VO2Max score obtained refers to the oxygen absorption and utilizing ability. Any number above sixty is considered to be in the elite athletic category. My score of 70, was well above the normal expectations for my age group. Needless to say, I was happy with my result, but there were a few more interesting findings to come. 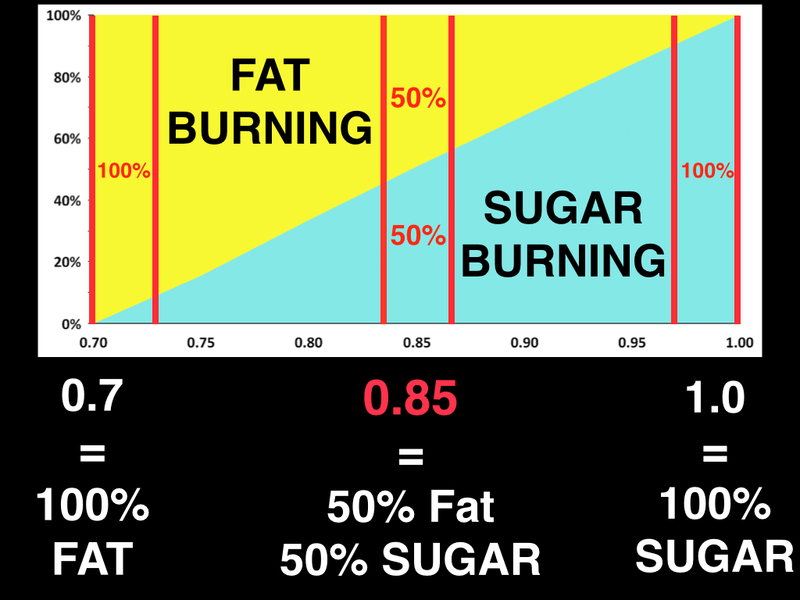 A score of 0.85 means 50% fat and 50% sugar burning. Standing on the the treadmill, waiting for the test to begin, the analysis of my breath was reading 0.66. I was burning one hundred percent fat – standing still. The doctors present, had never seen anybody with this low a reading before, let alone while not moving. Dr Kevin Vincent, who was monitoring my heart during the test, explained that he predominantly looks out for any sign of irregular heart function. A certain amount of irregularity is normal and expected. What he found unusual in my case, was that he did not see any irregular function at all. It is estimated that your max heart rate is 220 minus your age, which in my case would be 180. My maximum recorded heart rate on this particular day, was 192. Having scientific evidence validating the efficiency of my body’s performance, only served to confirm, that a high fat diet approach in physical endurance, was indeed extremely effective.